After I bought my first piece of cast iron I was so excited to bring it home and show it off to my husband. I loved the weight and feel of it and how cast iron has been used for hundreds of years as a cook surface. I then promptly let it sit on my shelf for almost a year before I actually used it. Why, you ask? I was super intimidated by it. I had no idea how to care for it or even cook with it. I just knew I wanted to. So eventually I got tired of moving it out of the way every time I went to grab a pan and decided I need to buck up and learn how to use it properly. 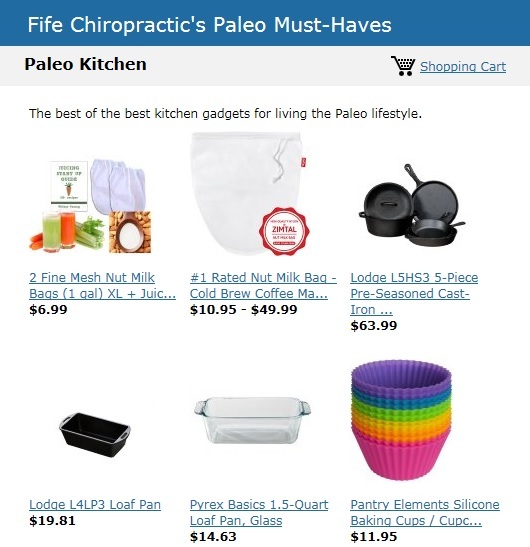 I read many different articles and watched YouTube videos and began to try out simple meals. I slowly learned cooking with cast iron really wasn’t as much about how I actually cooked on it but more so how important it was to properly care for it. Here is a basic how-to post on how to properly clean and season your cast iron so it will last you for years and years, consistently pumping out delicious creations. Most cast iron comes pre seasoned. This means that they coated it for you buttttttttt in my experience it is still best to give your cast iron another seasoning when you bring it home. Pre-Heat your oven to 350 degrees. Place a cookie sheet on the rack directly underneath the one your pan will go on (this is to catch any oil drippings that may happen while you are seasoning). Lightly rub a cooking oil all over the pan so that it is completely covered in a light/thin oil. I generally use organic palm shortening for this. Place the skillet upside down directly onto the rack and bake it in the oven for 1 hour. Let it cool completely and you are done. It isn’t a bad idea to do this 2-3 times before your first time cooking on your pan. You will notice over time you may need to re-season your cast iron because your food is beginning to stick to it more or it is becoming harder to clean it. This is normal. I like to try and re-season all my cast iron when it is warm enough outside to have the windows opened. It gets a little smokey and stinky when you do this. Again, this is normal. You may also notice that if you haven’t used your cast iron in a while it might start to get a little rust on it or have an odor to it. Re-seasoning will fix these problems for you and your skillet will be as good as new! 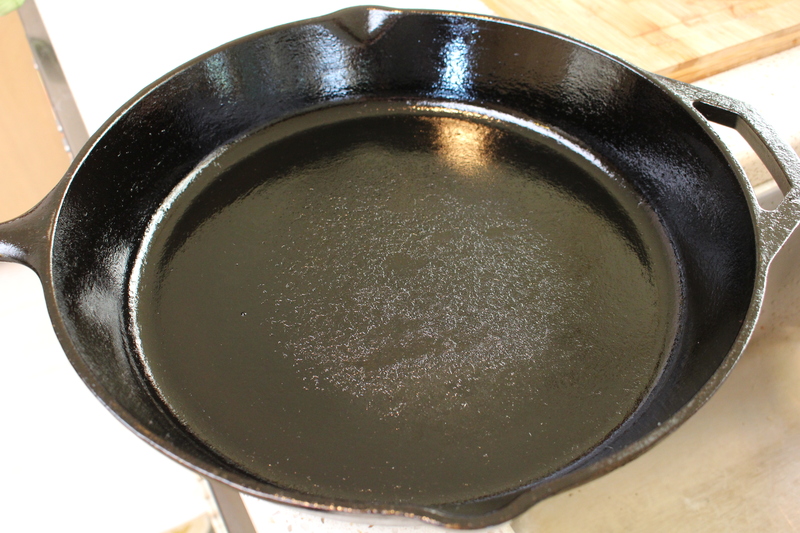 Begin by lightly scrubbing your cast iron with steel wool to get any rust off or stubborn stuck on food that can’t be removed by normal cleaning methods (click here to learn more about every day care for your cast iron). Rinse all the debris off with water. Dry the skillet and rub all over with a cooking oil (again, I use a vegetable shortening for this but any oil with a smoke point over 350 degrees will work). Preheat your oven to 350 degrees and place a cookie sheet on the rack directly under the one your skillet will be placed on. Turn your skillet upside down on the rack and cook for 1 hour. Let cool completely. Once cooled, touch the pan and make sure the seasoning is smooth and not tacky or sticky. If it is you will need to use a higher temperature. You will have to re-season it again before you can cook with it. Start over again by lightly scrubbing it with the steel wool, coating with a thin layer of cooking oil, and baking at a higher temperature- try 375 degrees for another hour. This should do the trick. Good luck to you! I hope you learn to love cooking on your cast iron just as much as I do!